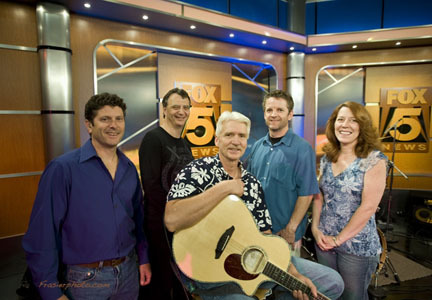 See the WD Miller Band perform live on the Fox 5 Morning News. Start with a big helping of goodtime 60s pop, throw in some fried Southern rock, mix with 70s California pop harmonies & acoustic guitars, and sprinkle in tight 80s arrangements. If you like catchy pop hooks and lots of vocal harmonies, the WD Miller Band will hook you. In November 2006, WD Miller released his second CD, Whirly Town. With the formation of the WD Miller Band, he has assembled a crack unit that generates great pop songs and high energy shows. The group has been performing to packed clubs around Northern VA, including Bangkok Blues (Falls Church), Jammin Java (Vienna), and Iota (Arlington). WD Miller, a home-grown Virginia boy, was weaned on the jangle guitars and harmonies of 60s pop and 70s California pop. Influences include Beatles, Beach Boys, Zombies, Tommy James, America, Bread, Eagles. WD started writing songs over 20 years ago, and has over 250 compositions to his credit. He has recorded two solo CDs, Sugarland Run (2000) and Whirly Town (2006). WD writes, sings, and plays rhythm guitar. He has recorded with a handful of local musicians, including Mike Melchione (Buckwheat Zydeco), Scott Shuman (Jackson St. Band, Henry Townsend Band), Kai Kapitano (Lost Highway Band), Bill Kotopish (Code Blue), Jim Opeka, Mickey Blue, Mark Kelley, Mike Johns, Mike Kelley, and James Manion (James and the Flames). The WD Miller Band started up after recruiting musicians for the Whirly Town CD release party; the boys in the band wanted to keep going! Peter Locke has been playing the guitar for thirty years. He played lead guitar with Exotic Vibrations out of Washington DC in the 1980s. Peter worked with Eric Brace--Last Train Home founder—in an earlier band called B-Time. He started playing bass in 2004. He played bass with the Idylwood Band in 2005. His shimmering guitar chops, catchy bass lines, and unbridled enthusiasm make their live shows a blast. Peter has found a home with the WD Miller Band. Reid Saunders has been playing drums off and on for over 30 years. His first instrument was the family furniture, and he never looked back. In Nashville, circa 84-'88, Reid played in the Rhythm Pigeons. He moved to Washington DC area in 1993 to play drums with the Cravin’ Dogs. Reid joined the WD Miller Band in 2006. Reid and Peter, the rhythm section, are the heart and soul of the WD Miller Band. Blayne Beeler, the newest member of the band, plays lead guitar. Blayne originally hails from Pittsburgh, PA. He picked up the guitar at nine years old when he heard his first surf instrumental, and has been picking and strumming ever since. Blayne played with many cover and show bands in the Pittsburgh area during the 1980s, including The Marcels, of 1950s “Blue Moon” fame. He moved to Northern Virginia in 1995. Blayne’s guitar playing adds precision, polish and a great pop sensibility to the band. Patty Williams has been singing professionally for 13 years in both the D.C. and Boston areas. She has performed at venues ranging from the local tavern to the Congressional Country Club, and even joined a Russian band for over a year, singing in Russian, Italian, French, and Hebrew. Although her favorite genre is R&B/Soul, Patty is comfortable and adept at singing in a variety of styles, from Whitney Houston to Janis Joplin.